Arresting perspective presentation of Cairo during the Anglo-Egyptian War. Birds Eye View of Cairo Looking North East. 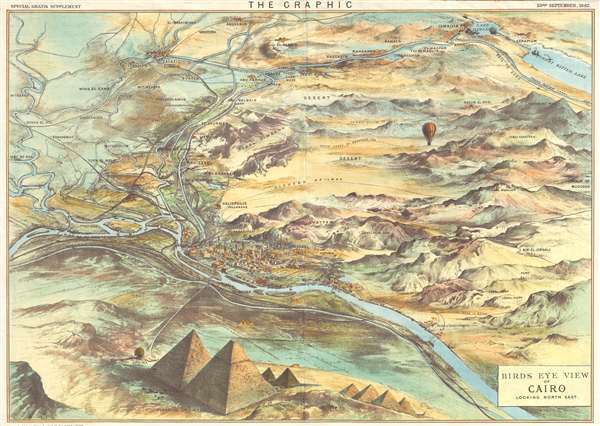 An uncommon 1882 bird's-eye view map of Cairo, Egypt. This view was issued as a supplement to the 23rd, September, 1882 issue of The Graphic. The view presets Cairo looking north east from somewhere high above the Treat Pyramids of Giza, which feature prominently in the foreground. Centered on the Nile, the full view covers from Abukebir to the Pyramids of Giza and from Subt ed Dak to the Plain of Muggreh. Numerous important sites are evident from the image, including the Citadel, Old Cairo, Heliopolis, and Bulak. Ismailia and the Suez Canal is visible in the distance. This map view was issued by The Graphic to capatiolize on popular British interest in the Anglo-Egyptian War. The Anglo-Egyptian War occurred in 1882 between Egyptian and Sudanese forces under Ahmed ‘Urabi and the United Kingdom. It ended a nationalist uprising against the Khedive Tewfik Pasha and vastly expanded British influence over the country, at the expense of the French. This began an extended period of Biritsh influence in Egypt, including occupation by British troops, until the Anglo–Egyptian Treaty of 1922 and Anglo-Egyptian treaty of 1936 returned gradual control to the people of Egypt. The Graphic (1869 - 1932), first published in December 1869, was a weekly illustrated newspaper published in London, England. Published by Illustrated Newspaper Limited, The Graphic was founded by William Luson Thomas to compete with the popular Illustrated London New, which he believed to be unsympathetic towards artists. The Graphic prospered, becoming the most successful rival of the Illustrated London New despite being more expensive. The popularity of The Graphic was most likely influenced by its inclusion of works by famous writers such as H. Rider Haggard, Thomas Hardy and George Elliot, as well as its gifted artists: George Millais, Sir Samuel Luke Fildes, Sidney Sime, Helen Allingham, and Frank Brangwyn, among others. The Graphic covered literature, art, sciences, music, sport and opera, along with news from all around the British Empire. With regular readers that included the likes of Vincent Van Gogh, the paper had a significant influence in the European art scene. After the death of Luson Thomas in 1900, The Graphic was managed by his son George Holt Thomas until it ceased publication in 1932 after a brief change of name to The National Graphic. MacLure, MacDonald and Company (fl. 1835 – 1992) was a lithographic engraving and printing concern active Glasgow, London, and Liverpool and Manchester from 1835. The firm was founded by Andrew MacLure and Archibald Gray MacDonald in Glasgow. The firm rose to prominence through rapid adaptation of new technology – such as the costly acquisition of a German Georg Sigl printing press in 1851 that enabled them to print a previously unheard of 500 sheets an hour. In 1853 they were also the firm in the U.K. to embrace the use of steam power for their lithographic press. By the middle of the 18th century they attuned the honorific of 'Ornamental Printers to the Queen.' They are best known for their many images for The Graphic as well as numerous postage stamps for foreign national as far off as Uruguay and Sarawak. The company was still in business in 19932 when it was acquired by J. R. Reid Printers of Blantyre. Very good. Original centerfold exhibits some wear. OCLC 54620287. Yale University, Beinecke Library, 61AM C12 1882 / 15532698.